These fluffy apple cinnamon scones, filled with diced apple and mini cinnamon chips, are the perfect sweet treat for breakfast or a snack! I debate every fall between apples and pumpkin. Which fall flavour do I love more? I really don’t think I can choose though. They’re both amazing and I really just want to make (and eat) all of the apple and pumpkin things every single year. I’ll be honest though, I make apple and pumpkin things all year long. I see no reason to relegate them to being enjoyed only in the fall. They’re great all year so why do that? But I definitely do make more of the apple/pumpkin things in the fall. Because I can. Plus it’s completely acceptable to share lots of pumpkin/apple things, and nothing else at this time of year. 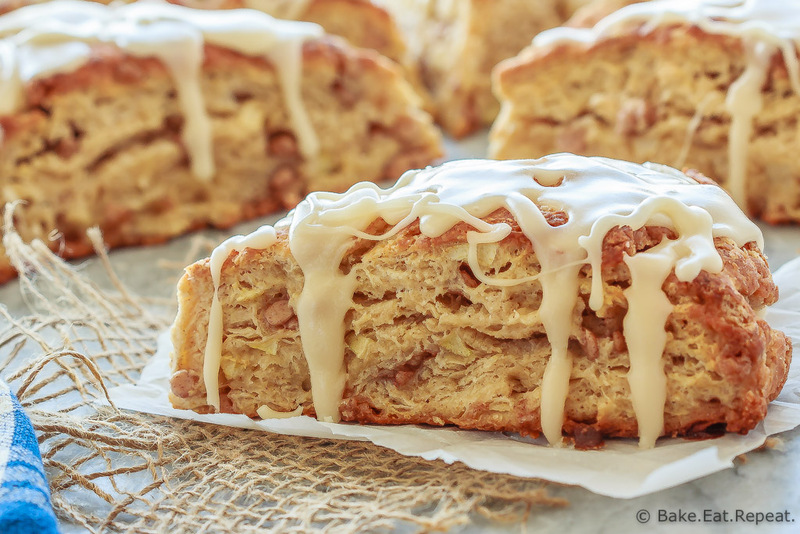 So….apple cinnamon scones today. And they are amazing. I’m a firm believer that if you don’t like scones, you’ve just never had a good one. So many people say they hate scones because they’re too dry or crumbly. 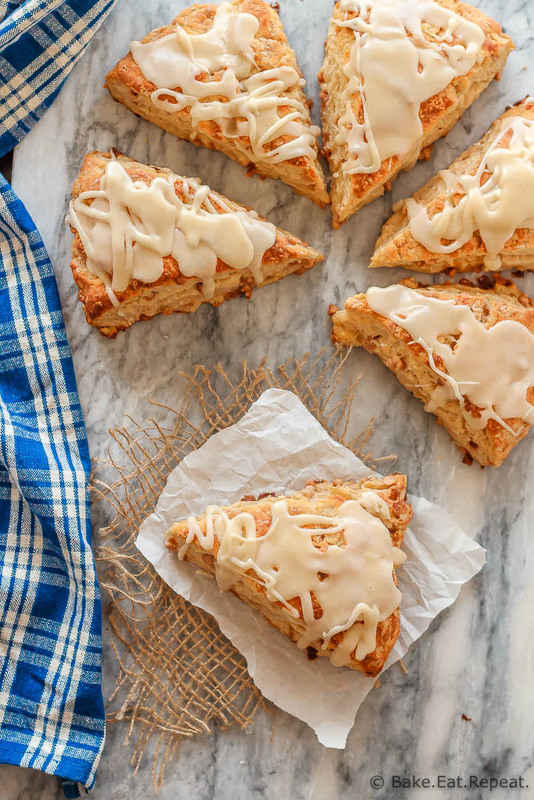 These apple cinnamon scones? Not dry, not crumbly – they’re delicious, I promise. Even if you think you don’t like scones, you should definitely try these. Light and flaky and filled with tender chunks of apple and mini cinnamon chips, and then topped with a maple glaze. It doesn’t get much better then that. And you could definitely leave the glaze off if you want these to be a little bit healthier. But, um….don’t. 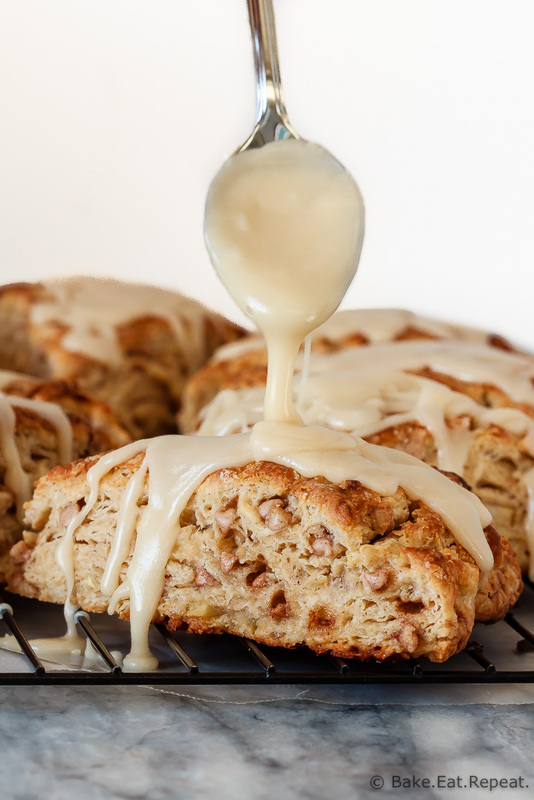 It’s fantastic and apple cinnamon scones are even better with a maple glaze. That’s just a fact. Also – cinnamon chips are hard to find here in Canada (I found them at Bulk Barn for any fellow Canadians that can’t find them!) so I haven’t used them much – but can I just say that they’re fantastic? They melt into these little cinnamon-y pockets in these scones that are just fantastic. So go make some scones. It’s apple season. 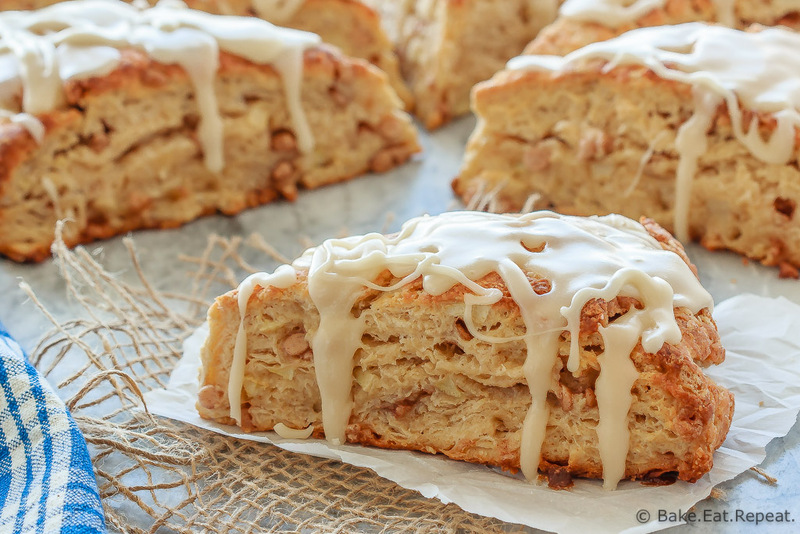 I’ve also shared this Apple Cinnamon Scones recipe over on Food Fanatic.